Our products are developed with you in mind. As we refine our products and develop new ones, we continue to link up with researchers to help guide our development. Milestones such as the ChromaLink™ Antibody Labeling Kit and the One-Shot (single labeling) versions of our kits represent our commitment to consistently providing innovative products to meet the changing needs of our customers. 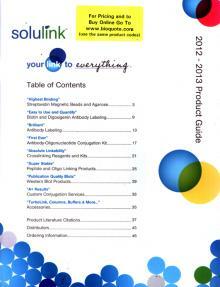 ChromaLink™ One-Shot Antibody Biotinylation Kit - Brilliant! APC - Antibody Conjugation Kit - Brilliant!